A few weeks ago Karen gave me a tour of the communications bench in the electronics workshop, so I got to see some of the HF radio equipment that I will be working with in the tower at Rothera. This week I have been reading the operation manuals for some of HF radios used at Rothera. I will receive further specific training on using the tower radios with the programmed channels when I arrive at the base. This week I am just learning the basic generic operations of the radios. I am expecting the HF radios in the tower at Rothera to be busy this summer. They are used for flight-following operations, contacting SkyBlu (SBR) and Fossil Bluff (KG) for meteorology reports, contacting field parties, tractor traverse teams and providing a SAR watch. The main HF radios in the tower are Skanti TRP 8250-S radios. I really like the look of these radios. The control panel layout is uncluttered, spacious and generous and both the TX and RX frequencies are always displayed. Modern radio interface designers could look and learn. I have been reading the 02_OPERATION. I have found this video of the radio in operation useful and the guy is actual a bit of a comedian. These radios will be used for flight following. The approach sheet for pilots using Rothera airfield provides the HF contact frequencies which are 5080KHz USB, 7775KHz USB and 9106KHz USB. No doubt these frequencies will have been assigned fast recall numbers. This radio is used by SkyBlu and Fossil Bluff stations. It is probably too high powered for field party use. 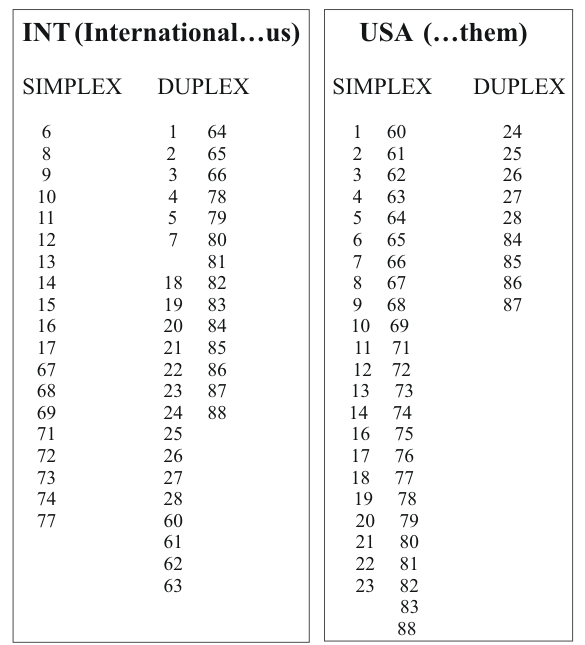 The ICOM IC-78 Instruction Manual, is an easy read, the manual is delightfully well written and concise. This radio has 99 channels to which commonly used frequencies can be assigned. So the first thing I will want to do when I meet this radio is look through the channels to see what frequencies have been assigned to the channels on my new friend. There a three ways to scroll through the channels, rotating that large dial, pressing the up or down arrow keys or typing channel numbers into the keypad. But this won’t show me the assigned frequency as I scroll through I will only see the descriptive name assigned when the channel was programmed. To see the frequency is assigned to each channel as I scroll through I can press the FC button to see the frequency and if it is duplex number pressing TXF will display the transmission frequency. To get even better acquainted with the IC-78 in Rothera I will then probably want to look through the setup options that have been configured on my friend. To enter setup mode I will need to press setup, then use the arrow keys to scroll through options, then within an option the large dial could be used to change a setting. So if I only touch the set button and arrow keys and be sure not to touch the dial then I can look through the setup configuration. 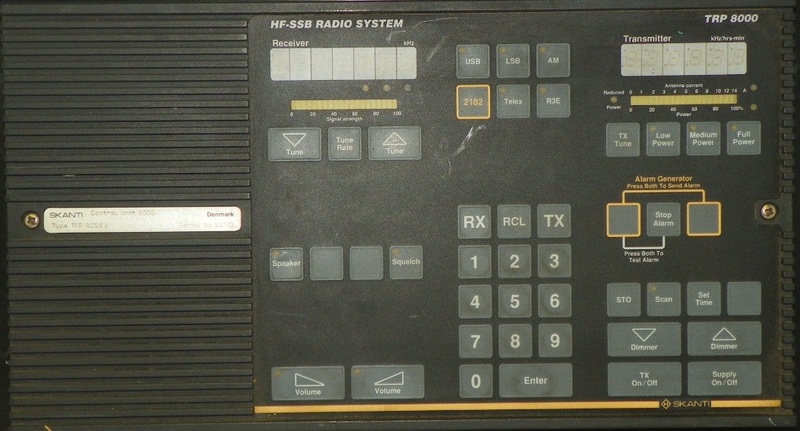 This radio is used by science field parties. It is a 25 watt field radio that can be carried in a manpack. 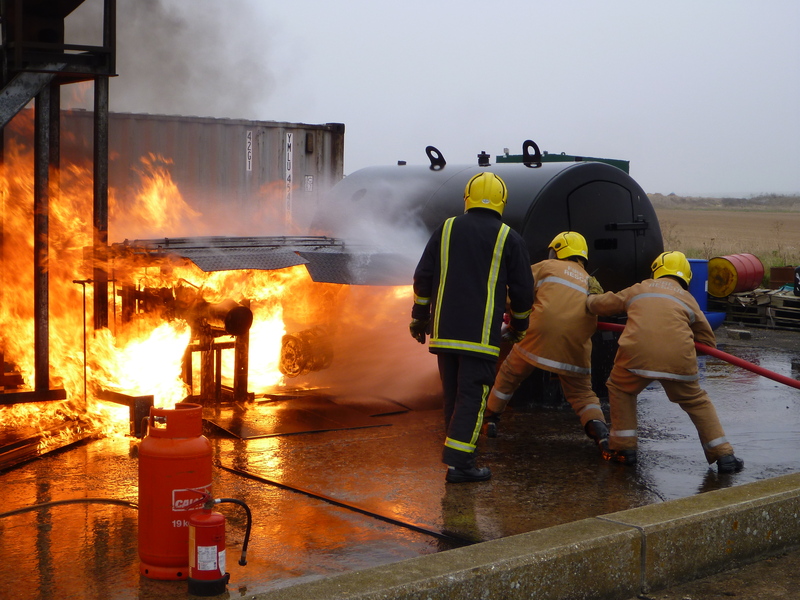 This week has been fire training at Duxford airport. Actually more like fireman training than fire training. The morning of the first day was the classroom part of the course. The focus was on dynamic risk assessment and identifying situations that should not be approached. The fabulous fire training team at Duxford had prepared a session specifically on the Dash 7 and Twin Otters which identified all the danger points on these specific aircraft. Things like location of hydraulic hoses, tyres and composite materials which are dangerous in a fire. We learned the conditions under which these become dangerous and how to position yourself to avoid them. Site selection for fire fighting was the next topic. The position of the fire appliance should ideally be upwind, uphill from any liquid fuel sources and in view of the flight crew in the cockpit so that communications with the pilot are established. All three will not always be possible. Communication with the pilot being the most important of the three. Propellers and engines could be started so the pilot needs to be are aware of the location of any actions by the fire team and they need a way to communicate there intentions to the fire team. After being kitted out with our fire fighting gear we piled into the fire truck for a ride to lunch. 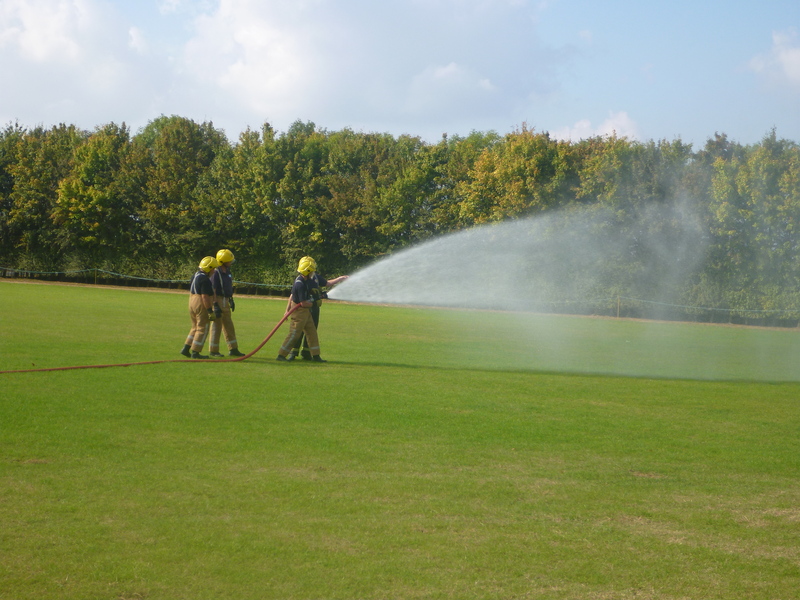 After lunch we learned how to use the various hoses and branches (nozzles). This was surprisingly heavy and exhausting work. I lost track of how many times we rolled, unrolled and extended the various hoses. The second day started with Breathing Apertures (BA) training with the very likeable Neil. 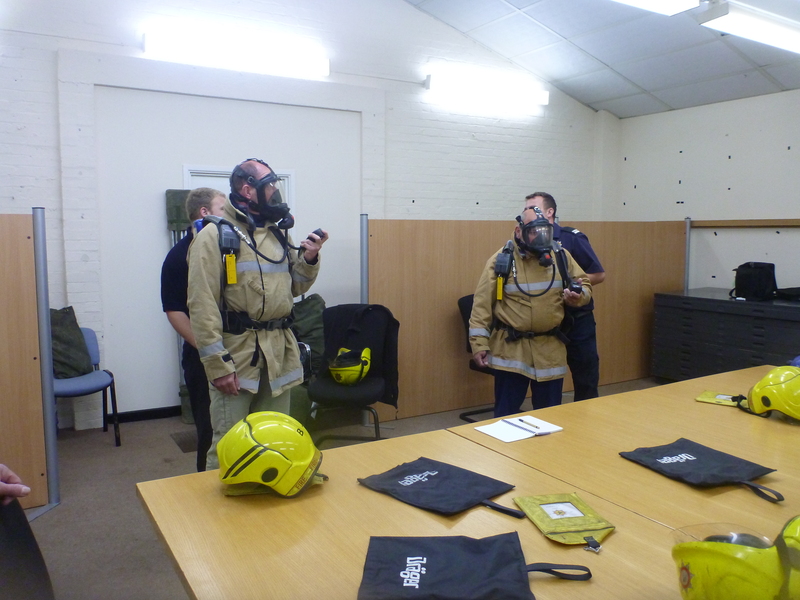 BA is very important piece of the fire-fighters kit, it means you can breath clean cool air. We learned how to dress in buddy pairs, checking each other at each step. The control board managed by a person in a yellow and black chequered vest is always used with BA to keep a record of times and pressures. Once we were dresses we were paired up for a search and recovery exercise. With our face masks blacked out completely. We learned to scan ahead with sweeps of our hands and feet before moving forward a step to systematically search a blackened room. 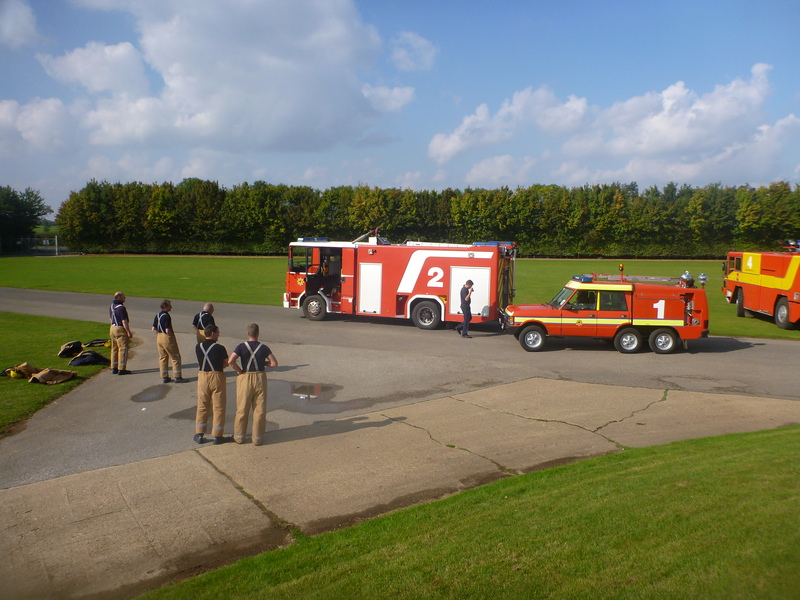 After lunch we fire-trucked over to the fire training ground on the far side of the runway. Here we practised and re-practised our BA procedures and control board procedures. Then we entered a training container where Alan lit a small wood fire. The container was fitted with temperature gauges at various heights to we could watch the hot level descending from the roof downwards. The third day was practical undercarriage fire-fighting practice on the Duxford simulation rigs. By this time we were all getting good at getting into our BA kit and working in our buddy teams to support the hose. At the end of this session we learnt how to lay a protective layer of foam onto a site after a fire has been extinguished. The afternoon was a full blow accident simulation with us all playing our roles. The training was fabulously hands-on and practical with a constant focus on safety and dynamic risk assessment. I have the perfect seat for undertaking my lessons on cloud classification. Straight out the back end of our studio I have a panoramic view of the sky and here on the Cambridgeshire Fens the clouds roll through much like they do at sea. It’s usually makes better watching than the TV. The Civil Aviation Authority and the Met Office appear to agree that there are ten types of cloud, plus a couple of bonus ones. I have been learning the two-letter codes for each of the ten cloud types and practising identifying them. Clouds can be classified in terms of either their height or their form. The three heights are high (15,000′ to 30,000′), middle(6,000-15,000′) and low(below 6,000′). And the four forms of cloud are cirriform (fairy floss), cumuloform (cotton wool), stratiform(blanket) & nimbus (rain). There are three high level clouds with a height between 15,000 and 30,000 feet to learn. 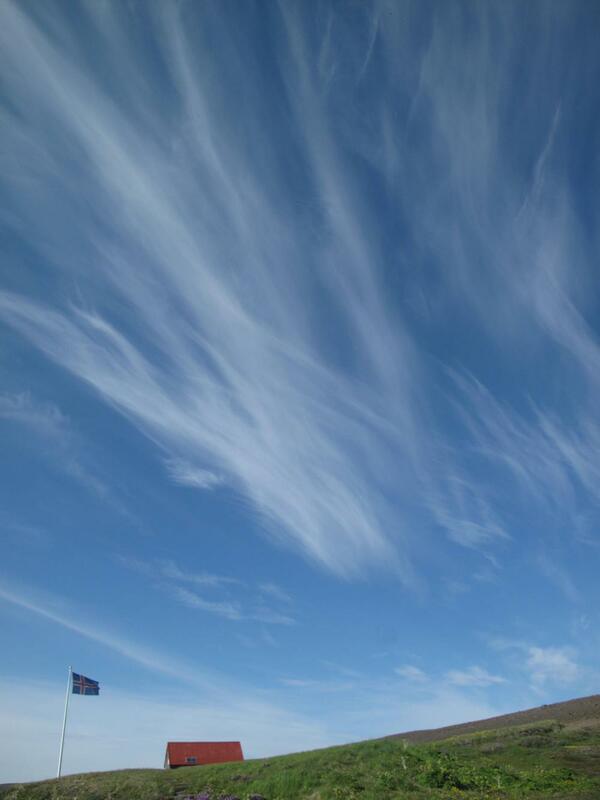 Ci – Cirrus clouds are whispy, silky, ghosty clouds high in the sky. Because they are so high in the sky they are made of ice crystals so tend to look very white. The height is high and the form is cirriform. Cc – Cirrocumulus clouds are a bubbly semi-transparent film high in the sky. The film will typically be pocked, bubbled or rippled. The height is high and the form is cumuliform. Cs – CirroStatus clouds are very high hazy, flat featureless blanket. The sun is usually visible through the film as a disk with a red fringed halo. The height is high and the form is stratiform. There are two middle level clouds between 6,000 and 15,000 feet to learn. Ac – Altocumulus clouds are like sheets of cotton wool balls fairly high in the sky. They tend to run in lines or waves. The globs may be separated or touching. The height is medium and the form is cumuliform. As – Altostratus clouds are uniform blanket of greyish or bluish sheet, very slightly transparent usually enough to see the sun as a fuzzy bright white disc through. The height is medium and the form is stratiform. There are 5 low level cloud types below 6,000 feet to learn. Ns – Nimbostratus clouds appear as a darkish grey blanket covering the whole sky and thick enough to hide the sun. They are rain bearing. It may be a middle or low height cloud and the form is stratiform. Sc – Stratocumulus clouds are a white or greyish sheet of lumps or rolls. Showery snow or rain may be associated with these clouds. These are what I see out my window today. They are a low level cloud that are cumuliform clouds that have formed into a stratus blanket. 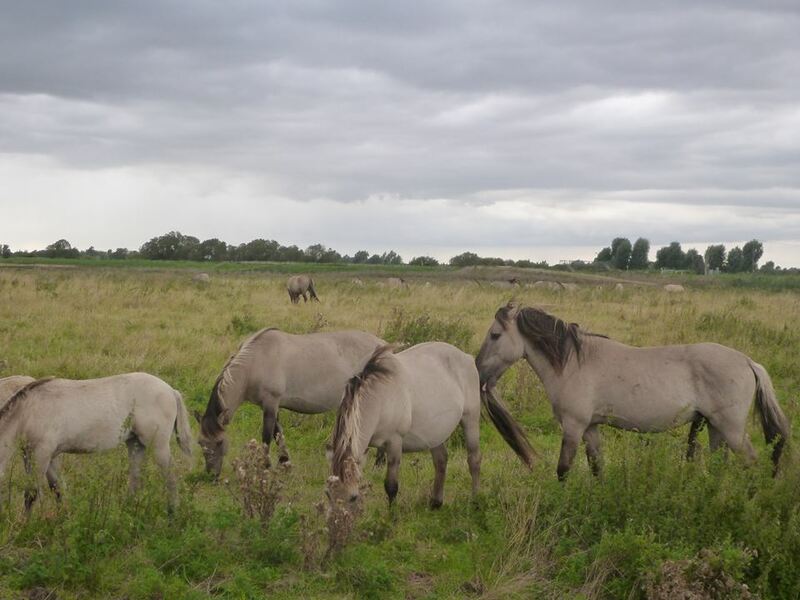 St – Stratus clouds are the classic low greyish blanket so common in England. These clouds often produce a light drizzle of rain or snow. The height is low and the form is stratiform. 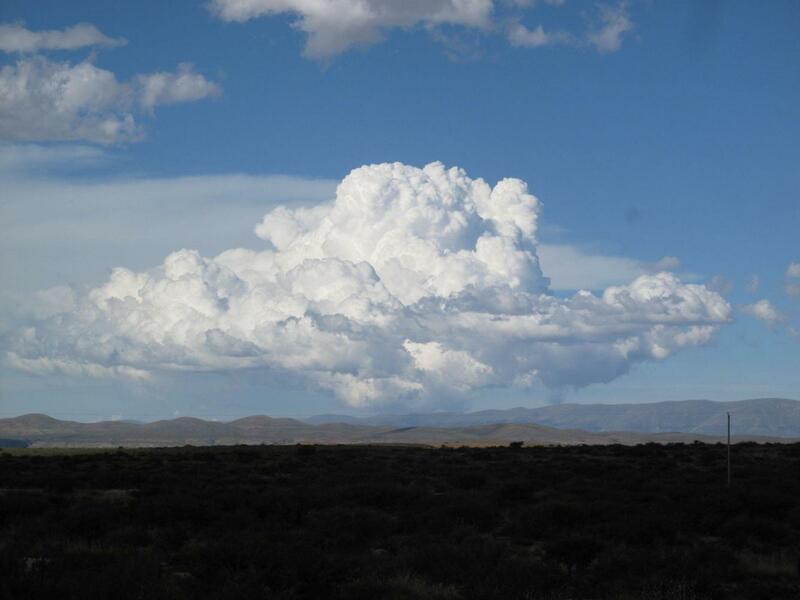 Cu – Cumulus clouds are the glamour cloud and most peoples favourite cloud. They are fluffy heaps sometimes with a greyish base. Typically cauliflower-shaped but your imagination is the only limit. The height is low and the form is cumuliform. Cb – Cumulonimbus are high towering storm clouds and are a danger to aviation. Lightening, thunderstorms and hail are usually near these clouds. The height of the base of the cloud is low but the tower may extend high and the form is cumuliform. Lenticular clouds also need to be mentioned. Lenticular Ac – Lenticular Altocumulus are smooth, individual, almond-shaped clouds that form over mountains. 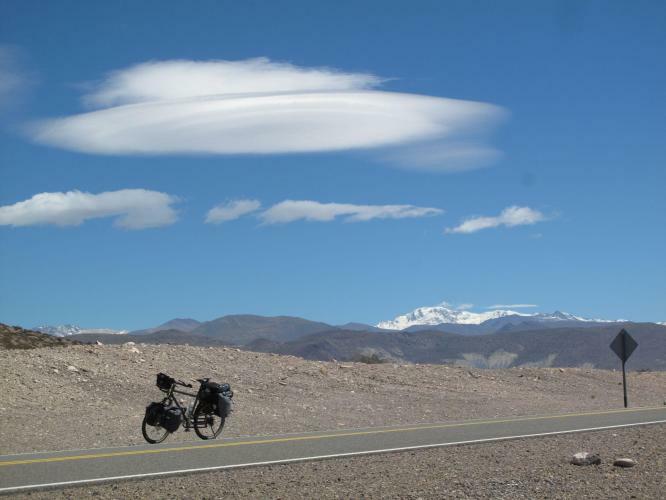 We saw lots of these as we cycled along the Andes in Argentina and know that the are associated with very strong winds. The cloud example images above are mostly from the Met Office training website so can’t be argued with. Below are some of my own photos that I have tried to classify, so please do to disagree if you think I have classified any of these wrongly. Ci Cirrus ? 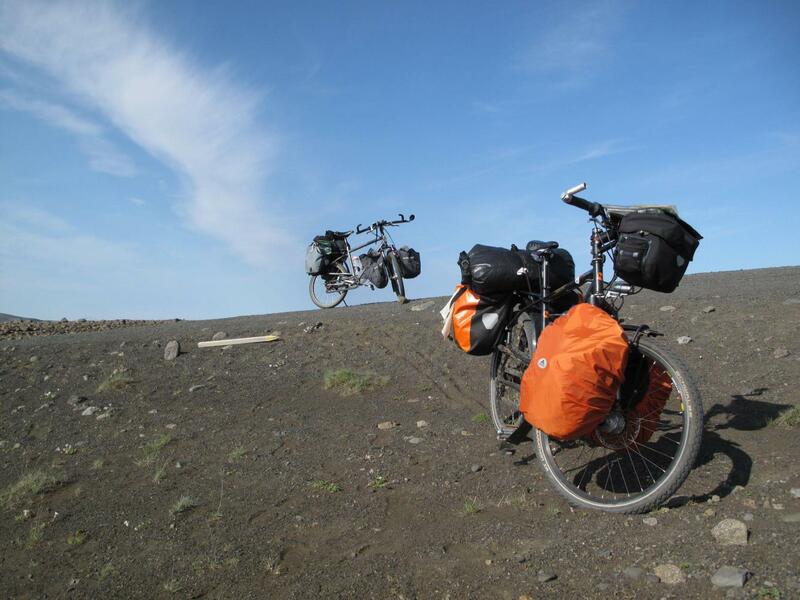 Central Iceland again. 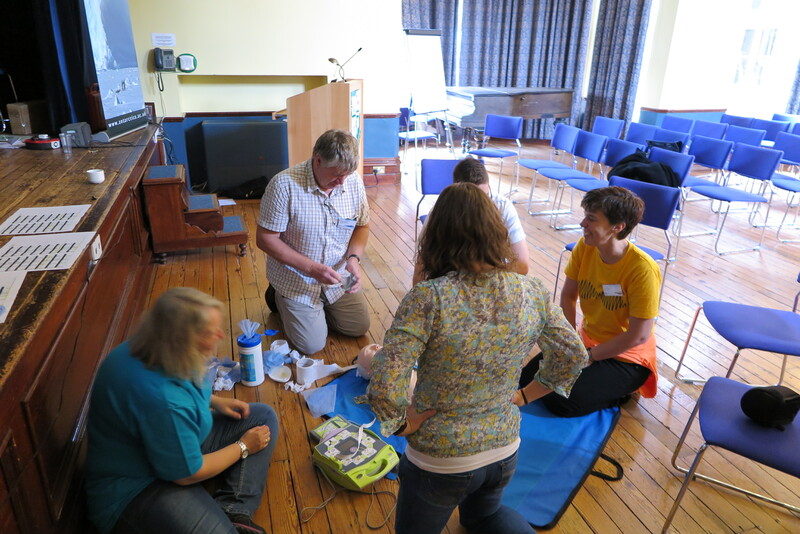 The first aid course follows directly on from the general pre-deployment training and is also held at Girton College as a residential course. Plymouth Hospitals NHS Trust are contracted to provide the British Antarctic Survey with a medical unit (BASMU) to provide medical advice, support and training More than 20 doctors, nurses and paramedics from BASMU came to Girton to help facilitate this amazing hands-on course for the 80 or so students. 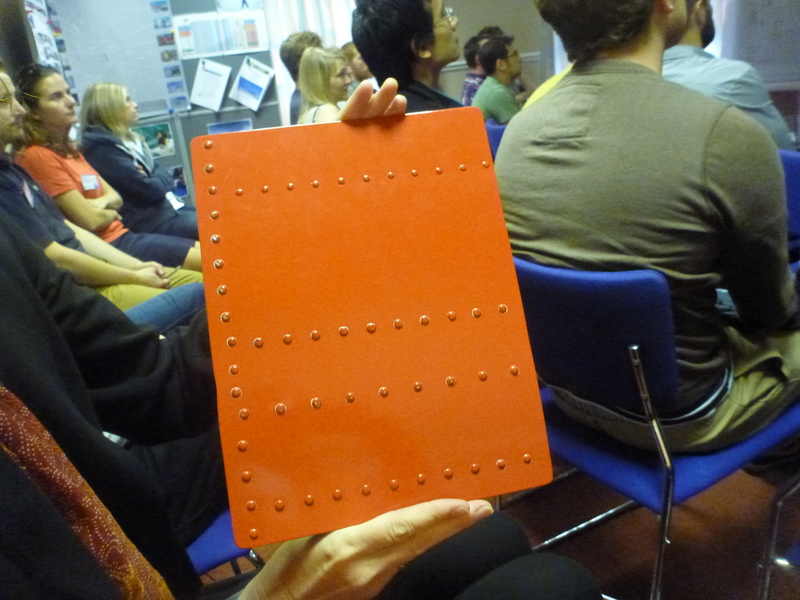 Everyone going to Antarctica attends the first aid training at least every six years. The course started at the unlikely time of 4.00pm on Wednesday afternoon . After a few talks on basic physiology and an introduction to the ABCDE assessment process we divided up into 16 small groups for the practical work. 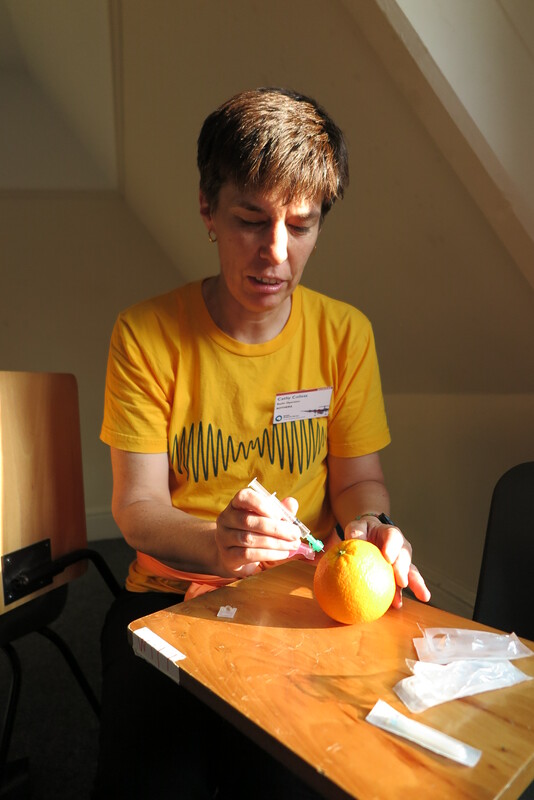 In our first small group session on Wednesday evening we learnt how to assess vital signs, pulse, temperature, respiratory rate and blood pressure. 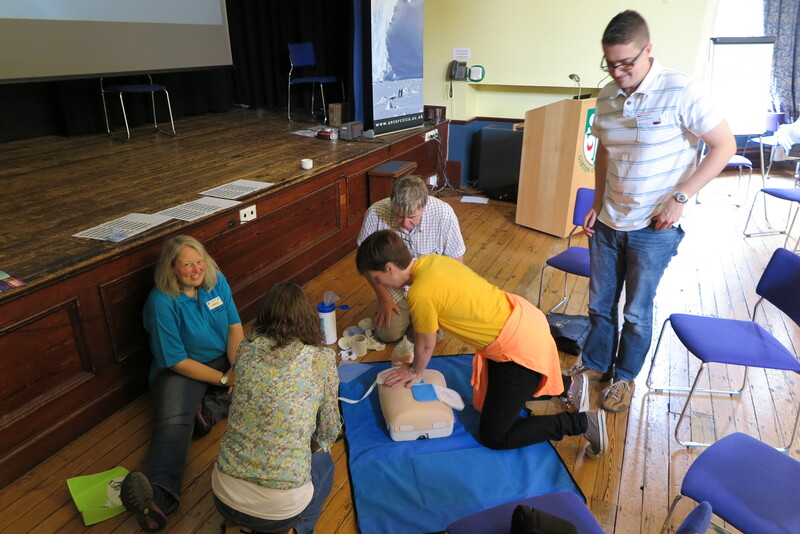 Basic Life Support was the first session on Thursday morning. 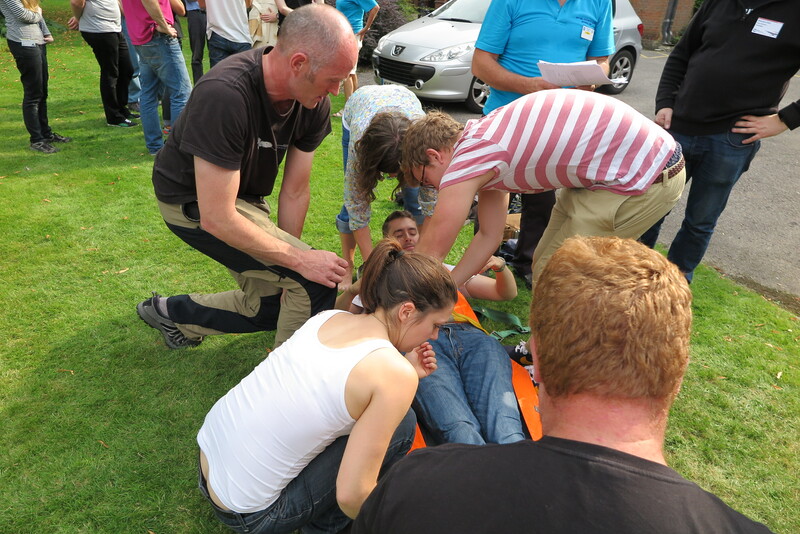 This session worked through a scenario of a patient in full cardiac arrest. The main focus was on quickly starting and continuing chest compressions to a depth of 5-6cm in the centre of the chest at a rate of 100-120 compressions per minute. 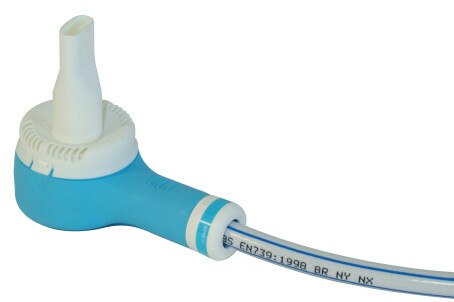 If possible with two breaths also be added to the airways after each 30 compressions. This session also covered use of the defibrillator and team organisation in a CPR situation. And if I do say so I think Team 3 worked very well together. The next session was on airway management. The A in our ABCDE model and is the very first issue to be assessed in a first aid situation. We had learned in our life support session that it’s surprisingly exhausting tilting the head of an unconscious patient to keep their airway unobstructed by their tongue. In this session we learned about inserting nasal and oral inserts to keep the airway clear. We also got to try a variety of face masks and pumps to assist the patient breath. Pain relief was the next session. We learned about the various types of pain relief available on station. Next session was giving intramuscular injections. We learned to use the needles, check for allergies, buddy check process for read backs of medication type and dosage. We also discussed site selection. For the novice the buttock is probably the best site and the upper outer quadrant of the hot-cross bun is the right location. Fortunately we used oranges for our attempts. Safe disposal of the sharps was also covered. We then all gathered back in the hall as a full group for lectures on limb and spinal injuries before lunch. We learned about splints and head stabilisation in cases where a spinal injury is suspected. In the afternoon we were back in our groups for more hands-on for C-spinal. This one involved working as a team to log-roll a patient with a suspected spine injury onto a spinal board. Friday morning was a series of practical assessments in surprisingly realistic scenarios. The part of the patients in these assessment activities were play by actors from the Casualties Union. 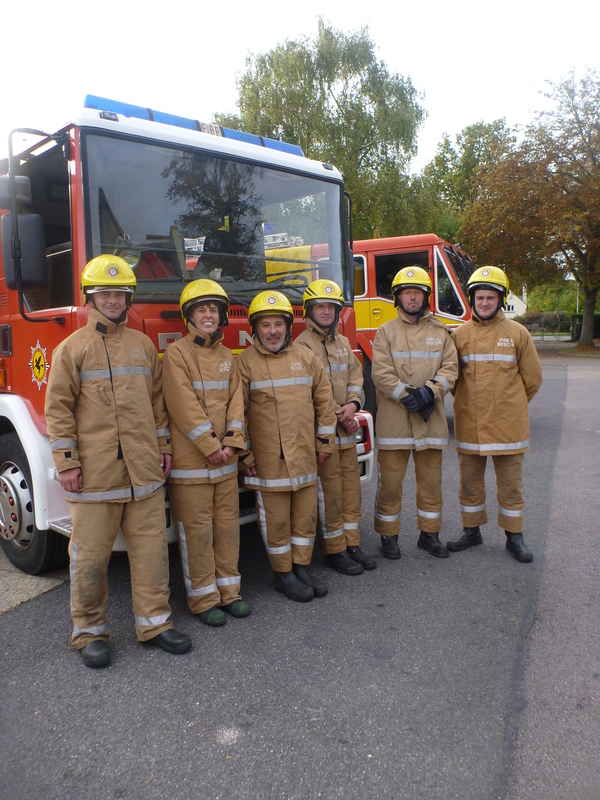 The actors wear very realistic make up and are trained to accurately and convincingly present the symptoms and signs of the conditions in the scenarios. The course concluded with some final talks on physiotherapy and dental care. And we were awarded certificates at the end. Girton College Pre-Deployment Conference has a freshers-week atmosphere. A lot of work and organisation has clearly gone into organising this complex event. I was warmly greeted on arrival then directed first to the college porter who gave me a key to my single bedroom, then towards the registration desk where I picked up my information packed conference badge, bag and wifi password. 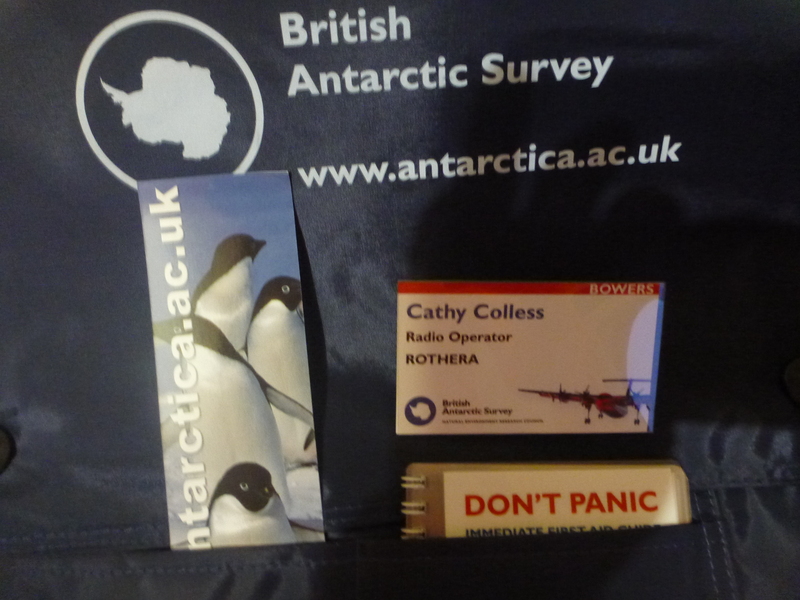 My tensions eased when I opened the conference bag to see in big red letters the words “Don’t Panic”. Then a quick ID photograph before moving to the coffee/tea room. Because I am only going for the summer I was excused from the blood type testing. The evening kicked off with a welcome from Jane Francis the Director of BAS followed by a breakout into Base specific groups. Each of us had to introduce ourselves and explain what we were off to do. Then it was dinner at the Girton College banqueting tables. Monday started with a session on the logistics of travelling to Antarctic. The 3 gateway ports are Capetown, Punta Arenas and the Faulkland Islands. And from these gateways the final hope will be either a ship or a Dash 7 flight. My travel will be on the 5 hour long flight from Punta Arenas on 21 October. The Antarctic clothing and working session was next up. Lots of sensible advise about layering clothes aiming for a sustainable day-in-day-out system. The recommendation for sunglasses is for category 4. The HR session was next and was very nicely facilitated. We broke into small groups and discussed some case studies around issues such as bullying, responsible use of alcohol and dignity in the workplace. After a quick coffee break we were into the aircraft session which explained the types of aircraft and work that the air unit undertake. The Twin Otters always fly with an assistant (co-pilot) and the Field Operations Manager runs a roster of base staff assignments for this duty. Predictably all the questions focused on who and how to bribe people to get co-piloting opportunities. The Science sessions were exceptional, my chest grew 2 inches with pride just knowing I was going to play a small part in the delivery of these inspiring science projects. 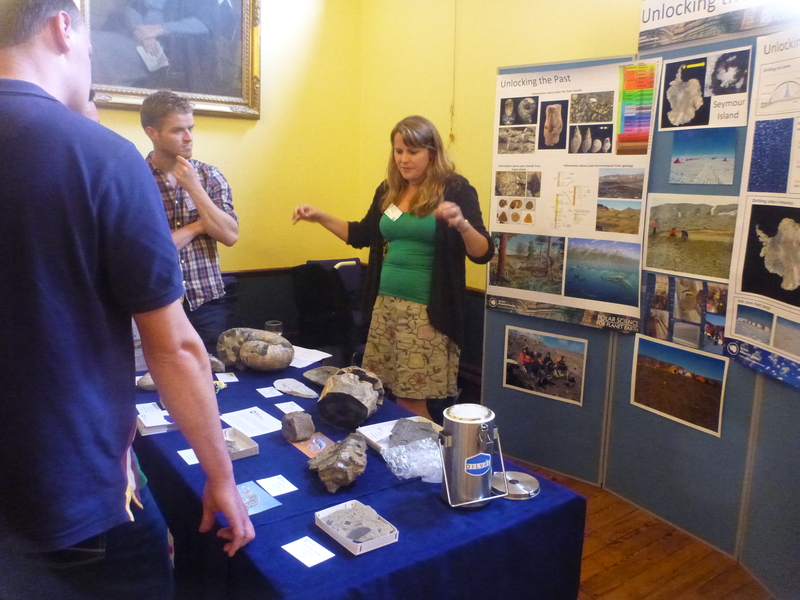 The Science Stations briefings were exceptional this one had 800,000 year old ice cores and tropical plant fossils. Over lunch we had the opportunity to visit a range of information/poster booths setup by the Polar Data Centre, HR, MAGIC GIS and Information Services. 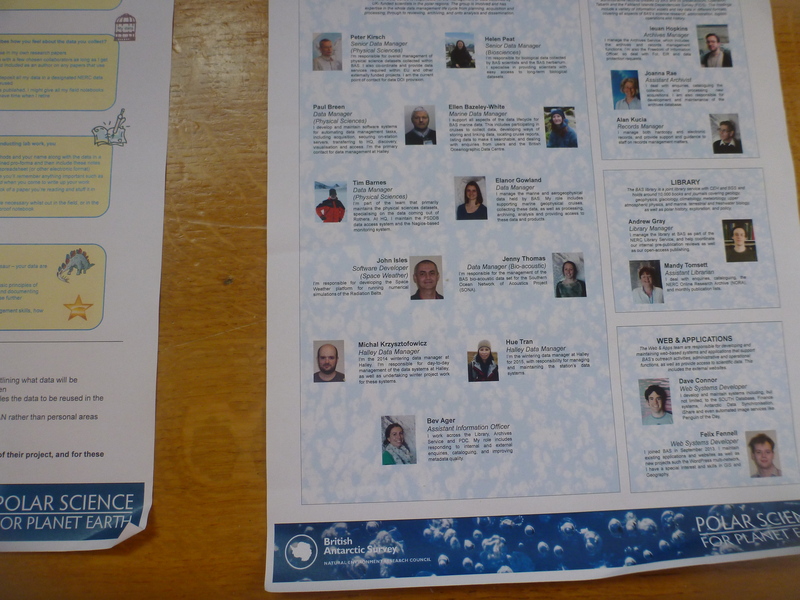 Who is that guy on the Polar Data Centre Poster ? Twin Otter body section. Surprisingly thin and flexi. Safety and personal responsibility were a constant theme across all of the sessions. Two of the first days sessions focused on the procedures and expectations regarding safety. The hour before dinner was spent in our “base groups”. For me this meant I was with by far the largest group, for Rothera. This was the point in the conference I really started to appreciate what an adventure this summer will be. There are so many incredible field expeditions leaving from Rothera this summer and I will be the friendly voice at the end of the radio for these field parties. Each day I will spend 15 minutes speaking to each party. Initially I will give and take meteorology reports, ask if they have an requests and log these into the field request system, ask whether they need anything notified through to Base Commander, Doctor or FOM and check the status of their CO2 detectors. Then free-chat, where I will relay any news or points of interest, or just make them listen to me waffle. After dinner I joined the Field Party job specific group meeting. This session talked through the operation and systems for supporting field work. We also got a walkthrough of the new Operations GIS system being developed by the MAGIC GIS team at BAS. Tuesday breakfast at 7.00am then back to the sessions. Henry Burgess from the Foreign Office was the first person I had seen wearing a tie at the conference. Henry kicked off Tuesdays schedule of sessions, reminding us that we are a presence as well as a scientific base. And that at all times our behaviour needs to be professional and respectful of the environment. Rachel Clarke took us through our important environmental responsibilities while living and working in Antarctica. Rothera is covered by the Antarctic Treaty so strict rules, fines and reputational damage could result from any breaches. 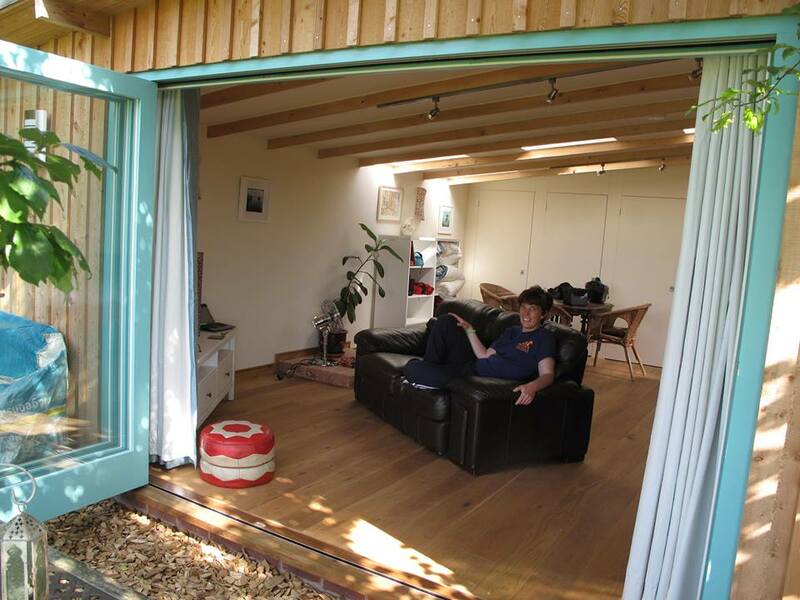 Plants and animals cannot be disturbed without a scientific study permit. Strict procedures needed to be followed to prevent the introduction of non-native species. 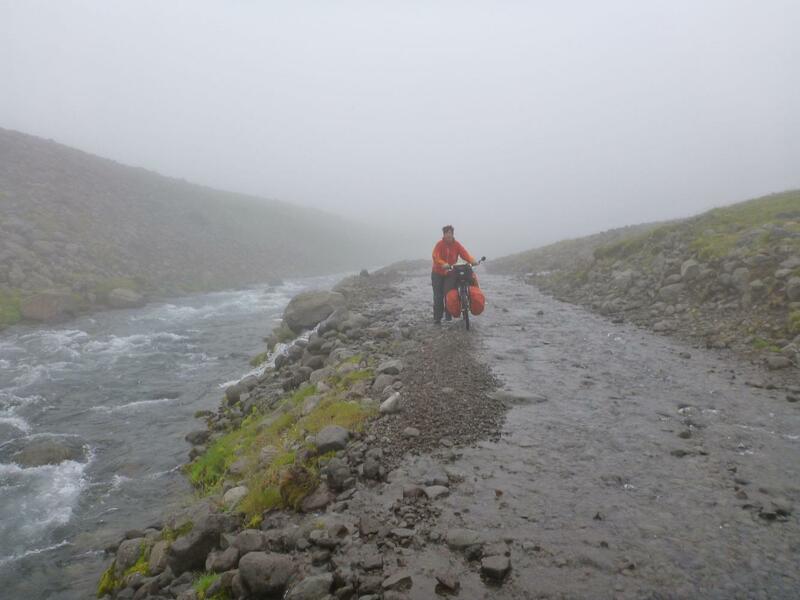 We were advised to thoroughly clean all our footwear and outerwear before leaving. We will need to keep a 5-10m distance from and not feed any wildlife. We can remove pretty much nothing from Antarctica, no plants, eggs, rocks, fossils or meteorites . Moss grows so slowly that footprints could last for decades, so walking on moss is a very strict non-no. All waste except treated sewerage and food waste must be removed from Antarctica. And importantly this session explained poo-bins, solid human waste cannot be left in the field. This means that we will need to carry and use little plastic poo-bins. Fuel spills are a significant issue so the other point that was emphasised was never-ever to leave re-fuelling of aircraft or vehicles unattended. We must stay and watch any refuelling process from start to end un-distracted. A particularly useful session was the one run by Pete Bucktrout the BAS photographer. Condensation is the killer of cameras in Antarctica. Bringing a cold camera directly from a cold environment into a warm most tent or building will kill it with moisture from condensation. He suggested that after using a camera in the cold we should remove any frost from the camera with a soft shaving brush then seal the cold camera in plastic bag before bringing the camera into a warm environment, leave the camera in the plastic bag until it reaches inside temperature. Also worth noting that Pete recommended using UV lens covers and said it is worthwhile considering bringing a go-pro video camera. He also noted that a manual view-finder is useful as LCD screens don’t work below -20 and manual contrast control is useful. Craking good session ! The final practical session was about the two BAS ships the Ernest Shackleton and the James Clark Ross. Many of the conference delegates (not me) will travel to the conference on a ship and this session explained what to expect onboard. At lunch we lined up in the courtyard for the traditional group photograph. The afternoons sessions were about team work and motivation. 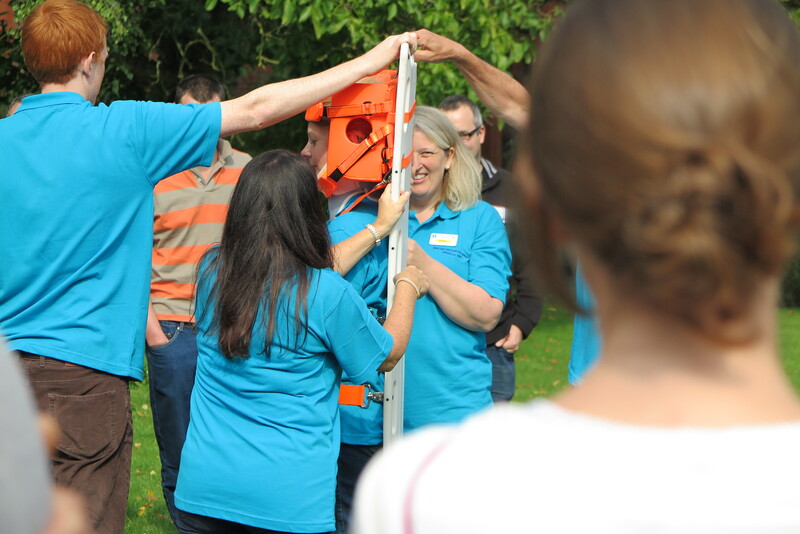 The activities involved a stick lifting exercise, an auction of team attributes and some fun sessions on managing conflict. This was followed by a more sombre presentation on HR requirements. Adam Bradley then gave an amazing presentation about his trips to Antarctica followed by some jaw dropping footage from Pete Bucktrot’s work. When pilots use an airfield they follow published airfield procedures . I have been learning how Rothera airfield is used and what procedures arriving and departing aircraft need to follow. 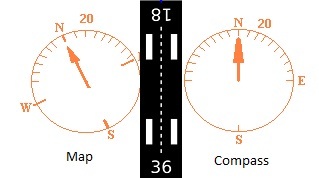 The most basic piece of information a pilot needs about an airfield they intend to use is the magnetic heading of the runway. They can’t land sideways onto a runway so obviously they need to know what their compass needs to be pointing as they approach the runway. Because this information is so fundamental it is actually encoded into the number assigned to the runway. For example Cambridge airport runs kinda east-west. Approaching Cambridge Airport from the east you need to be heading 230 degrees on your compass to hit the runway directly and approaching from the west you would need to head 050 degrees (180 degrees from 230). Cambridge runway has therefore been assigned runway numbers 05 and 23. The runway number tells the pilot the heading to approach the runway with. Rothera runway numbers are very easy to remember as the magnetic heading of the runway is straight north-south. The runway numbers assigned are therefore 36 (from the south) and 18 (from the north). The number 36 would be painted in big white numerals at the southern threshold of the runway and 18 at the northern end of the runway. that the co-ordinates are given in True while the runway is given as a Magnetic bearing. Because of the vicinity to the South Pole there is a significant difference between true and magnetic headings at this latitude. The variation is 21 degrees east. 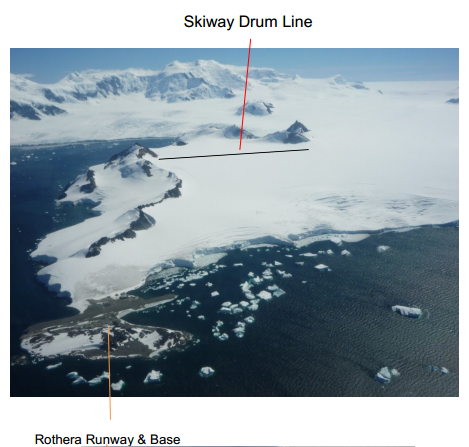 Maps of Rothera runway will show it pointing at one o’clock. But if you stood on the southern end of the runway a compass would point at twelve o’clock. The circuit direction is also important airfield information . 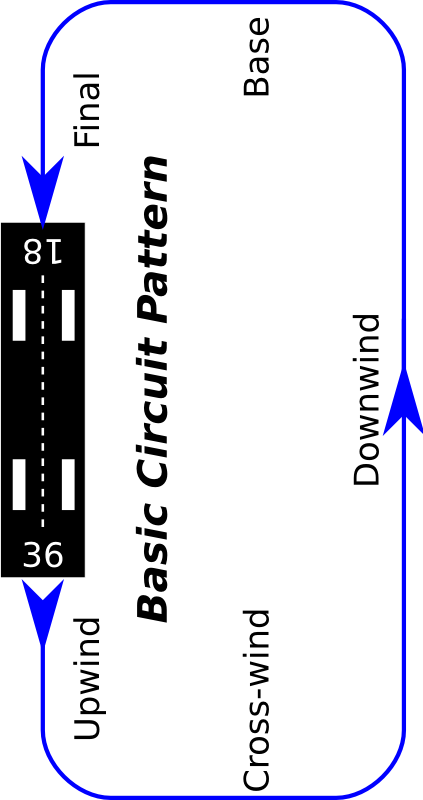 The circuit direction is described as either left-hand or right-hand, according to which way the pilot turns in the circuit. At Rothera there is a large mountain to the west of the runway so the circuit is always to the east of of the runway. This means that Runway 36 has a right-hand circuit and Runway 18 has left hand circuit. There is unlikely to be a lot of circuit traffic at Rothera. But the circuit direction and circuiting procedure will still be important to pilots because they may choose to do a go-around then come back around circuit or have a problem such as a bird strike during a take-off and want to come around the circuit and land. Looking West. Circuit is on the east to avoid those mountains. The circuit height is 1,200 feet. The elevation of the airfield is a tiny 13 feet. The missed approach point (MAPt) is the point at which a pilot will decided whether they are going to continue into land or execute the missed approach procedure. The Rothera missed approach point RMAPt is 1.5 nm from the runway. 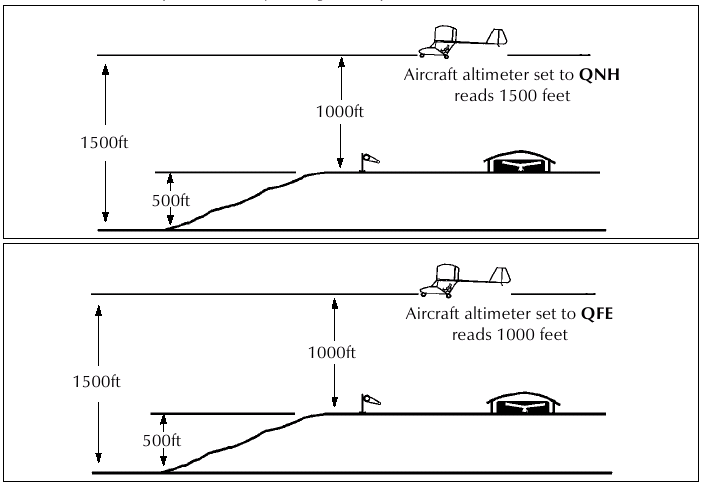 The minimum descent altitude(MDA) at the RMAPt is 700 feet. The local barometric pressure is an important piece of airfield information. Pilots use this information to calibrate their altimeters . Without an accurate pressure a pilot won’t accurately know their altitude(bad). Pressure is typically provided to pilot as hector-pascals for a QNH (pressure msl) or a QFE(pressure at the runway threshold). Because the runway at Rothera is only 13 feet above msl there is very little difference between the QFE pressure and the QNH pressure. The QFE is one hector-pascal lower than the QNH. 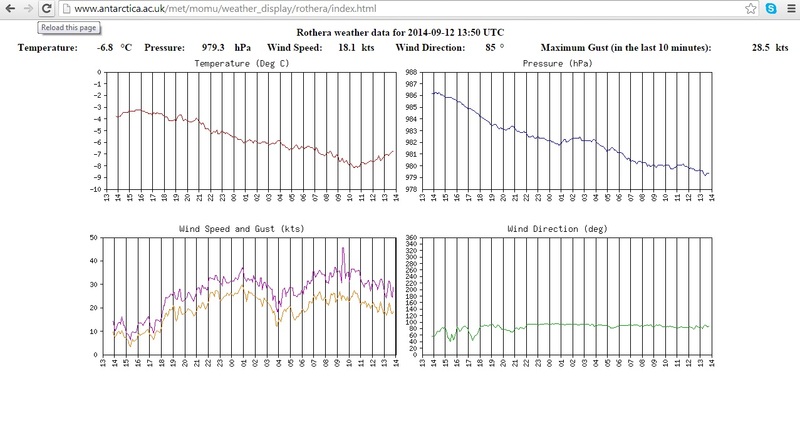 So I just looked at the current pressure measurement for Rothera and I can see that it is reading 979 hPa. From this I know that the QFE is 979 and the QNH is 980. The VHF frequency 129.7 MHz is for Traffic Information Broadcast by Aircraft (TIBA) in the region. Pilots will listen to the is frequency and broadcast any pertinent information for other aircraft in the vicinity. There are various ways aircraft can contact Rothera tower. Rothera is a prior arrangement only airfield so any visiting aircraft will have phoned to make arrangements prior to departing. For long distance contact with Rothera tower from the air pilots have three HF channels 9106.0 kHz, 7775.0kHz and 5080.0kHz. Alternatively the aircraft have Iridium satellite phones and could call the tower on 881 631 831 227. Once closer to the station probably less than 50 miles they should be able to make VHF radio contact on 118.1 MHz from which we would expect a clearer and more reliable connection. We will be listening on all of those communication links in the tower, so I hope that don’t all go active simultaneously. 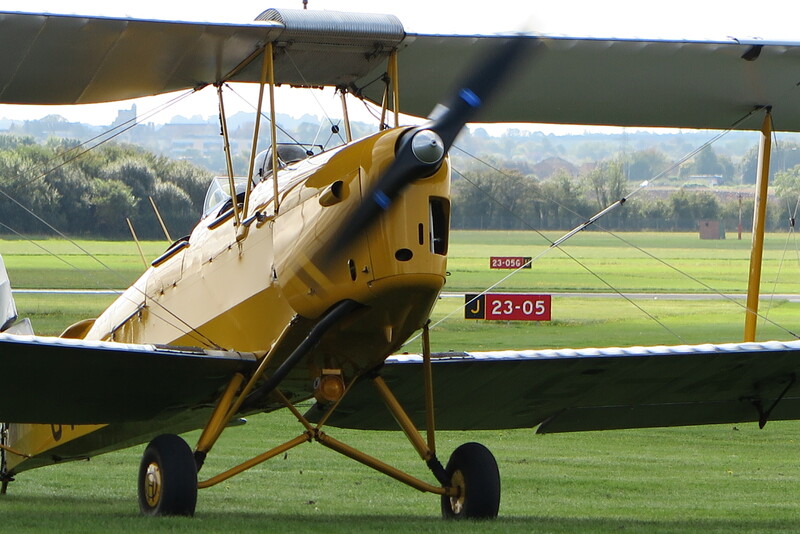 The official hours of operation of the airfield are 1100 to 0000 Zulu time, Monday to Saturday, October to February. 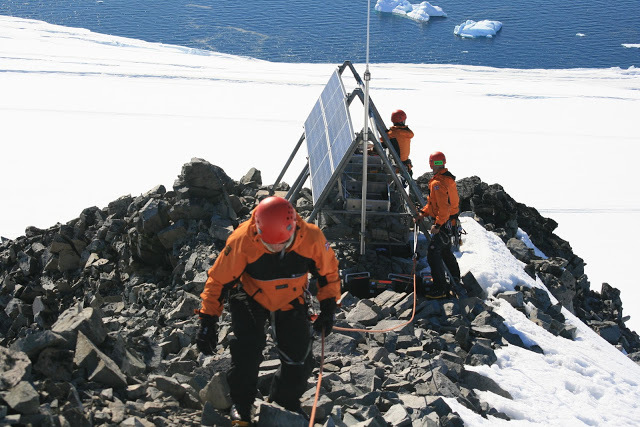 Zulu time is UTC and the time offset at Rothera is UTC-3 (P – Papa time). Converted to local time the operation hours will be 0800 to 2100 local time. But in reality we will work much longer hours than this in the summer if the weather is favourable for flying. Flying was a very tangible freedom. In those days, it was beauty, adventure, discovery, new worlds. Not any more. The International Civil Aviation Organization (ICAO) was formed in 1947. And today flying is very a regulated and planned activity. Pilots strictly follow ICAO FPL flight plans. All Dash 7 flights in and out of Rothera require the submission of an ICAO FPL flight plan to the global Aeronautical Fixed Telecommunications Network (AFTN) cloud. One of the computers in the tower at Rothera has been connected to the UK AFTN Parent node located at the CAA London Control Centre in Swanwick . This computer is running an AFTN Terminal Application that can send and receive flight planning and meteorology messages to the AFTN cloud(via Swanwick). To prepare for a Dash 7 flight we will need to send an FPL flight planning message (based on a template) to the AFTN and record the AFTN message number onto the flight following log sheet. When the flight departs we will send a DEP message to the AFTN and record the message number on the log sheet. Once the aircraft arrives at the destination an ARR message will be sent and logged. We will also be able to use the AFTN terminal to report delays (DLA), send progress report messages, request METAR meteorology reports or if necessary cancel (CNL) a flight plan. If the AFTN terminal fails the backup procedure is to print the FPL form (CA48) and fax the form to Swanwick. We will also receive AFTN messages such as METARs and flight plans and progress updates sent by other stations regarding aircraft in the vicinity. I will be trained in the specific processes for managing the Dash 7 plans when I arrive on the base, however this week I have been learning generally about UK Flight Planning procedures. Yesterday we visited the operations tower at Duxford Airport and learned about the systems and procedures to submit, activate and progress FPL flight plans via an AFTN terminal. Colin also usefully suggested that I read the CAA UK Flight Planning Guide CAA CAP694. Nowadays flight plans will almost always be submitted electronically either via an AFTN terminal like they do at Rothera or online via the flight planning webpage . But I found that initially attempting to understand how to complete the paper form and read the raw text FPL messages was a good way to start gaining an understanding of the layout and coding requirements of flight planning AFTN messages. At first sight the form and message seems quite impenetrable. But of course once you learn the message format and all the codes by heart the form magically transforms from a wad of meaningless gobbledygook-gook into a gloriously concise and precise presentation of a large amount of information. The remainder of this story will discuss in some detail the individual fields on an FPL message, if that’s not of interest to you then you might want to leave it here. Otherwise, grab a hot drink (you will need it) and let me talk you through the format and coding of a ICAO FPL flight plan message. The Aircraft Identification code (Callsign) is the first question in the FPL message section of the form. I will need to have the BAS aircraft callsigns at the tip of my tongue when I am working in the tower. The bathroom wall is kindly helping me learn these. X = Other than any of the defined categories above. The Number of Aircraft field is left blank unless it is more than one. No codes to learn. The Type of Aircraft code is the ICAO Aircraft Type Designator which can be looked up in the ICAO DOC 8643. 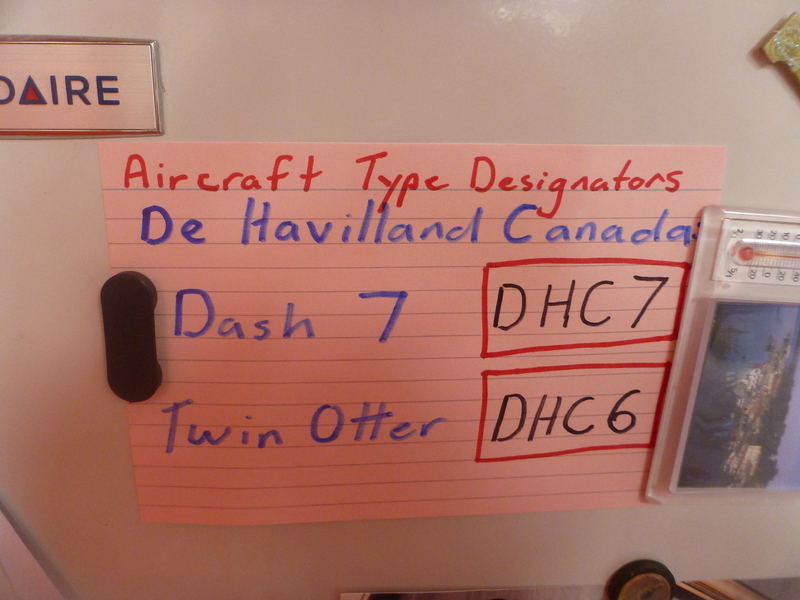 I will need to know the BAS aircraft designator codes without needing to look them up and hence am learning these with the help of the fridge. The Equipment field has two parts with a / used as a field separator. On the left side of the / the Radio, Navigation AND Approach Instruments are coded. 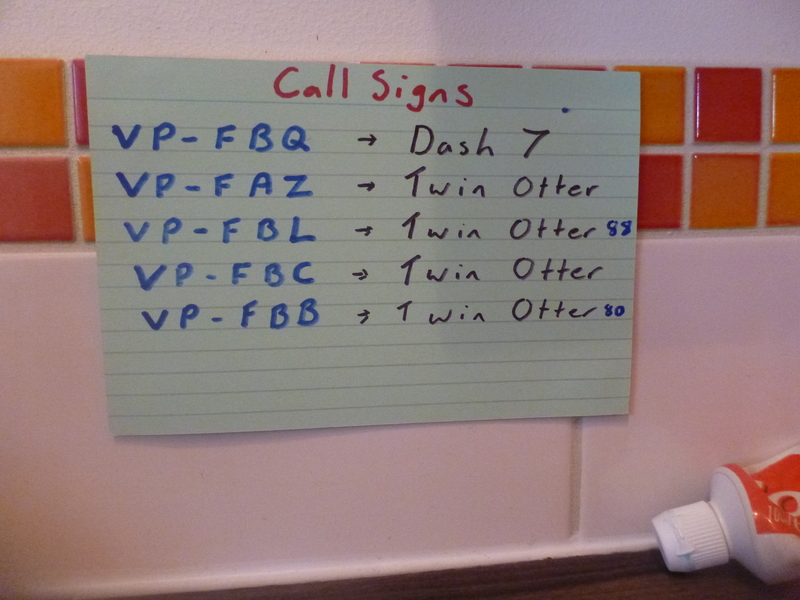 The letter S can be used to note that the standard equipment including VHF RTF, VOR and ILS is fitted. On the right side of the / SSR transpoder and other surveillance capabilities are noted. So for example -S/C indicates standard equipment and a mode Charlie transponder. The Departure Aerodrome code is entered as an ICAO airport code. I unquestionably need to learn these by heart for the airports in the vicinity of Rothera so they get prized position at the kitchen sink. And if the aircraft is already in flight then AFIL can be entered. 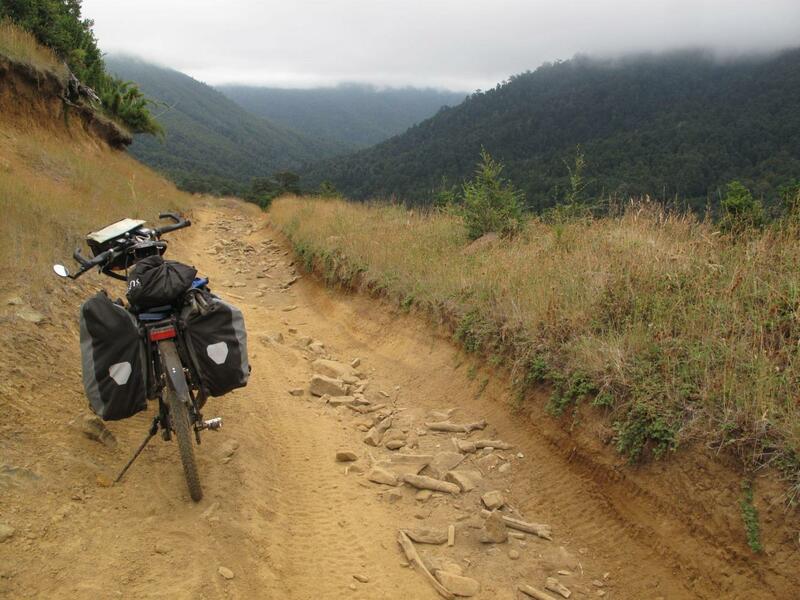 The Time of Departure is always entered as Z-Zulu time which is UTC. The planned Route section of the form is where the details of planned changes to speed, levels and flight rules will be entered. For us this information will be provided by the Flight Operations Manager and we will enter the details into this section. I might write another post about the format of these plans. It is too much to go into here. The Destination Aerodrome is entered as an ICAO airport code. I have already discussed ICAO airport codes in the departure aerodrome section so I won’t repeat it. The Total EET Time is the total estimated elapsed time. It is worth emphasising that this is NOT the estimated time of arrival. This is the total estimated time required between take-off and arriving over the destination aerodrome. The EET is expressed in hours and minute as a 4 digit number. 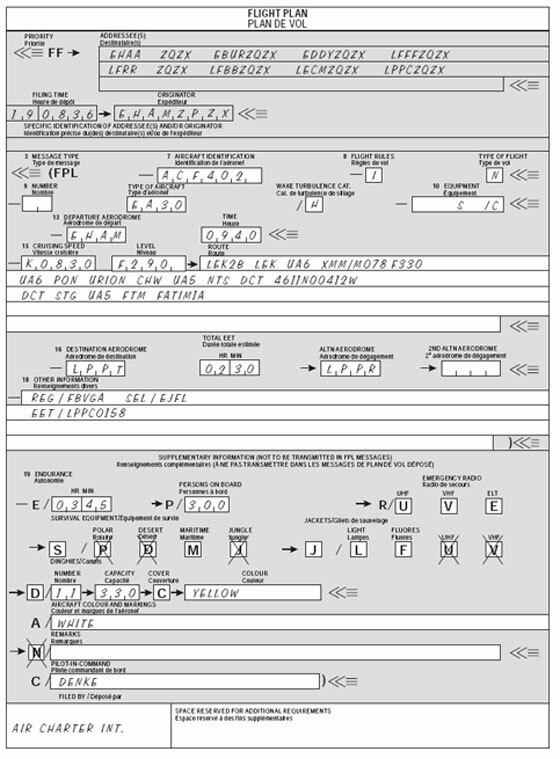 For example a flight with and EOBT of 0900 and an EET of 0130 would have an ETA of 1030 and only the 0900 and 0130 values are included on the form. The Alternate Aerodrome is entered as the ICAO airport code for the airfield where the pilot will take the aircraft if the destination airfield cannot be reached. For example SCRM (Marsh Airport on King George Island) might be an alternative airfield for a flight to SCCI (Punta Arenas). The FPL plan will appear in the AFTN terminal of the Alternate AIrfield so that they are aware of the information within the plan and can monitor the flight progress updates. Again use ZZZZ and manually enter the name preceded by ALTN/ in the other information field if the alternate airfield has not been assigned a ICAO airport code. In the Other Information field you can enter a 0 (Zero) if there is no other information. But that will not be the case as a minimum the date of the flight (DOF/) in YYMMDD format will be entered into this section. It’s also very likely that some information about the IFR instruments and capabilities of the aircraft(PBN/ and NAV/) will be included. These information included in this section will be very specific to the aircraft equipment and routes. I will learn more about what information is included in this section . When I arrive in Rothera. It is perhaps worth mentioning that the coding of this information changed in 2012. The Supplemental Information is not included in the main FPL message, it is kept at the location where the FPL is filed. In the Endurance (E/) field enter the fuel endurance in hours and minutes format. In the Persons On Board ( P/) field enter the total number of passengers and crew if this is not known at the time the plan is submitted you can enter TBN. The three Emergency Radio (R/) check-boxes should be reviewed and crossed out with a large X if the aircraft is not equipped with the relevant radio. If the aircraft does not have UHF on frequency 243.00 MHz then put a cross through the U box. If the aircraft does not have VHF on frequency 121.500 MHz then put a cross through V box (but this is very unlikely). If the aircraft does not have an emergency location transmitter (ELT) then put a cross through the E box. The four Survival Equipment (S/) checkboxes should also be reviewed. Put an X through the P if polar survival equipment is not carried. Put an X through D if desert survival equipment is not carried. Put an X through M if maritime survival equipment is not carried. And put an X through J if jungle survival equipment is not carried. The three Jackets (J/ ) checkboxes should be reviewed. Put an X through L if life jackets are not equipped with lights. Put an X through F if life jackets are not equipped with fluorescein. In the Dinghies (D/) section put an X through both D and C if no dinghies are carried. If Dinghies are carried enter the number of dinghies carried and total capacity, in persons, of all dinghies together. Put an X through the C if the dinghies are not covered and enter the colour of the dinghies. In the Aircraft Colour and Markings (A/) enter the colour of aircraft and any significant markings. If you don’t need to enter any special Remarks (N/ ) Simply put a X through the N . You may however use this field to make remarks regarding survival equipment on the aircraft. In the Pilot field (C/) enter the name of the pilot-in-command. The FF header section at the top of the paper form isn’t strictly a part of the FPL message. A header would be needed for any message (eg ARR DEP). This informs the routing of the message that follows, much like the header in an email. – The 8th character is an additional letter to identify a department or process within the service area . The letter X is used if the department is not needed. So for example the destination address for the Tower at Mount Pleasant Airport in the Faulkland Islands might be EGYPZTZX. Another example could be SCRMZQZX for Area Control at Marsh Airport. The Filing Time is format is DDHHMM(Zulu). So for example 190836 means that the message was filed on the 19th day of month at 08:36 UTC time. The Originator Address will use the same format as I just talked about for the recipient but obviously this will be the address of the message sender.